Arms: Vert, an oak tree eradicated Argent, on a chief Or, between two trefoils Vert, a lion's head erased Gules. Crest: On a wreath Or and Vert, a lion's head erased Or, langued Gules. I live in Iliamna, Alaska. I am a retired licensed funeral director. My interests are in heraldry, fishing, hunting, and reading. 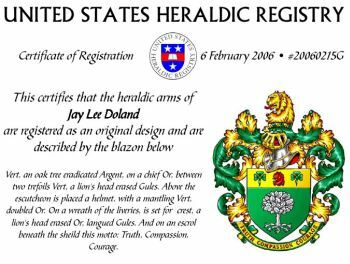 I am a life member of the American College of Heraldry, a knight of the Order of the Noble Companions of the Swan, Member of the Augustan Society, and a Honorary member of the Russian College of Heraldry. 2005 The Augustan Society, Inc. The trefoils (shamrocks) represent the orgins of the Doland family who imigrated from Ireland to the United States in 1840. The Oak tree represents the strength and fortitude of the family over the years. The Vert is representative of the Catholic past of the family in Ireland and it's service to the church. The Or lion (crest) corelates to the compassion and generosity of the family over the decades. Lastly, the lion Gules is a reminder of a family who had a warrior past.